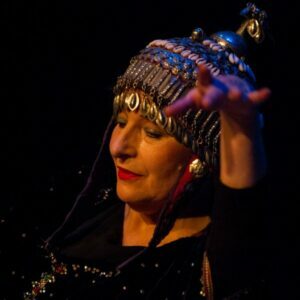 My dance troupe HAZIZ have been performing for over ten years and all our dancers have been trained by me – we have some lovely dancers and we put on gorgeous shows at Theatres, Art Centres, Weddings and Parties. When travelling to the Sinai desert was accessible I used to take out dancers to dance, travel on camels and live with the Mozeina Bedouin tribe which was a truly valuable experience. I am also a professionally trained actor and have performed in the West End in a Terence Rattigan play.. This is the most feminine and sensual dance. It makes you feel great and keeps you supple and toned. You will learn to dance gracefully and improve your posture and strengthen core muscles. Posture is extremely important for dance as well as for your own sense of balance and health. As well as making you feel beautiful it is also great fun with the addition of a few subtle cheeky moves to add a sense of humour. Traditional Egyptian Belly Dance includes classical and folk styles as well as contemporary. This can lead on to learning variations of other Arabic dance – Egyptian being the most sophisticated and developed and the most popular. The class is open to beginners and also for those who have been learning the dance for longer. I will teach technique as well as a routine and I hope to continue the class afterwards if people like it.